Amaravati , is chosen as Andhra Pradesh’s state capital ,even though SivaRamakrishna Committee report stated that ,it is not a judicious choice.One of the obvious reasons being building everything anew.Vijayawada , on the other hand could have been a better choice given the already existing infrastructure , as opined by many.However, save the recommendation and opinions from various corner , Govt. has opted for Amaravati, it has to build the roads, rail, airport, schools , public building, water supply or electrifying the entire region , the Chief Minister said “So be it”.The rationale behind the choice is explained below. Currently it is better known as a tourist town and was once the capital of the Satavahana dynasty. The place is a part of the Buddhist circuit and has a number of Buddhist relics as well as a stupa which was built during the reign of Emperor Ashoka.The Stupa is related to Vajrayan teachings of Kalachakra. The Amaravati School of art flourish here, whose sensibility and rendering human emotion onto the stone surpassed any other school of art of the times such as Gandhara or Mathura school of art.The women is best depicted in Amaravati school of art . Kālacakra refers both to a patron Tantric deity or iṣṭadevatā of Vajrayana Buddhism and to the philosophies and meditation practices contained within the Kālacakra Tantra and its many commentaries. The Kālacakra Tantra is more properly called the Kālacakra Laghutantra, and is said to be an abridged form of an original text, the Kālacakra Mūlatantra which is no longer extant. Some Buddhist masters assert that Kālacakra is the most advanced form of Vajrayana practice; it certainly is one of the most complex systems within tantric Buddhism. The Kālacakra tradition revolves around the concept of time (kāla) and cycles (chakra): from the cycles of the planets,to the cycles of human breathing, it teaches the practice of working with the most subtle energies within one’s body on the path to enlightenment. It is a vast plain area , easy to develop, and reasonably far from sea, thus making it a rather safer place. 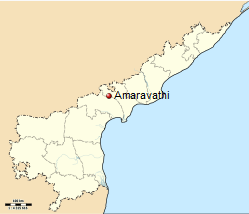 Andhra Pradesh is aligned in N-E and S-W directions and it would not be wrong to mention that it is a state with Nort-South stretch .Amaravati is at the centre , if viewed from the two extremes of North AP and South AP. It has the necessary social infrastructure i.e. it falls under the ambit of the VGTM-UDA (Vijayawada, Guntur, Tenali and Mangalagiri – Urban Development Authority) and has all the parameters to be developed into a world class metro. A particular ground reality has been missed by many , is that the land price around VIjayawada and the Managerial region has skyrocketed once it is believed that that either one of them is going to be a capital. Amaravati being little interior the land price fell substantially.If the news reports to be believed 1 acre of land priced around Rs 14 Crore near Vijayawada region.Given Govts plan it would have cost dearly to the government. It has its historic significance , a primary tourist center, part of HRIDAY scheme and Buddhist circuit , so to say , there is not only a realistic realization but also emotional satisfaction.This can be inferred from the fact that Govt had faced least resistance in acquiring lands ( already acquired 33000 acre). Acquiring land was one of the primary fears that waged against Amaravati as capital. Singapore created the master plan, Japan has been funding and the Chief minister aims to Make it the Indian Silicon Valley, hub of IT with adequate infrastructure and a smart city.